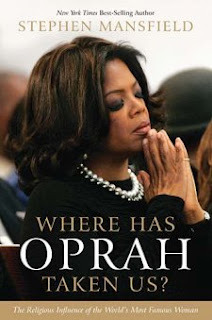 This book delves into the many influences that have brought Oprah to where she is today. It is very insightful and thorough. I found most of the information intriguing but got bogged down with so much information. She has so many influences and personalities in her life that it is no wonder she has such conflicting and confusing beliefs. The author presents the material in an easily readable way and the book is divided to make it easy to skip around and read about the individual people and their beliefs. It is divided into four main sections, the first two being the biography of her life, the third the biographies of the people who have so greatly influenced her and the last is about her philosophy and religion as it is today. Although, I have never held any regard for Oprah or been interested in her life, I was interested in learning about the people and their beliefs that have caused her to adopt so many belief systems. I learned about many influential people, what they believe and their relationship with Oprah; what I think is important to know in order to understand the many ideas floating around that people are putting their faith in. I also learned a little about Oprah’s life and can applaud her tenacity and hard work to get where she is today although it came at the expense of others. This is an insightful and informative read.